Lolly Buffets at events like weddings, birthdays and corporate events are an amazingly popular trend right now. 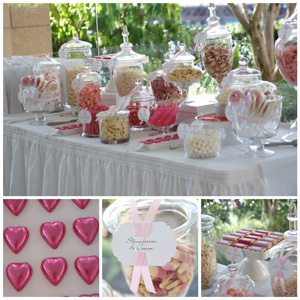 The basic concept of a lolly buffet (or Candy Bar / Candy Buffet as they call them in the States) is to choose confectionery in the colours that match your event and display them on a lolly table for guests to help themselves - These lolly tables not only look spectacular, but they also become a central conversation point for all ages. Very few people can resist a delicious looking Lolly Buffet! You might get some dessert table ideas from the blog of the queen of Lolly Buffets - Amy Atlas. Rather than crowd this category with each and every colour available, we have just selected a colour or two, or three!, to illustrate that this type of item is available from us - The fully variety available will be in the appropriate area (eg. Jelly Beans colours can be found in full in their catergory) you will also see suggestions of other colours when you click on the items below. Also, the goodies below are just a few of the lolly buffet / single colour confectionery goodies that you will find here so if you are planning a lolly buffet personally, or running a lolly buffet business (Don't forget our wholesale confectionery pricing sign in) please browse our entire site for ideas. Lolly buffets are it, right now, so if you need single colour lollies, or any other confectionery which matches a colour theme for your lolly buffet concept - and you can't find it here, please contact us and we'll do our best to find it for you. Please note that the products below are just a small selection of our 1,700+ lines of confectionery and single colour lollies for candy buffets, please see the product menu above to see our full range of products. Did you know that you are able to come into our warehouse in Castle Hill, NSW and shop directly with us? - There's no better way to see our range and check out if the colours we have are the right match for your (or your clients) candy table.